Thornburg Mortgage has said it is trying to raise almost $1bn (£500m) in extra capital to avert a possible bankruptcy filing. The lender, which specialises in big home loans, also plans to offer its lenders a 27% stake in the company. The measures will significantly dilute the stakes of existing shareholders and the company's shares fell 47%. Thornburg said that without the new capital it may be forced to seek bankruptcy protection. In a filing with the Securities and Exchange Commission, the company warned that bankruptcy would be a possibility because it would have to sell off the rest of its mortgage assets at depressed prices. 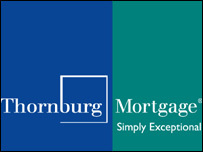 Thornburg specialises in so-called jumbo loans of more than $417,000, which means that until recently they were not eligible for funding from the government-sponsored mortgage agencies Fannie Mae and Freddie Mac. Thornburg's problems are another sign of the credit crunch spreading from sub-prime lenders to others. It owes money to five lenders, which are affiliates of Bear Stearns, Citigroup, Credit Suisse, Royal Bank of Scotland and UBS. The fresh falls in Thornburg's share price followed a 32.4% fall on Monday last week after the company said it could not meet demands for extra cash and collateral from its lenders.